This 2019 Book Will Completely Transform Your Relationship With Money and Happiness. When you join me as a part of this special insider launch team I’m going to shower you with goodies to help inspire you to live your richest life. 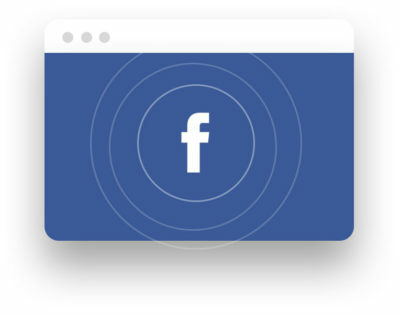 You will gain immediate access to a digital advanced reader copy! Discuss The Latte Factor directly with David, LIVE! This invite-only group will allow you to interact with others from the Insider Launch Team and with David himself. This 19-part video course features valuable worksheets. Previously available only to FinCon attendees, this recording features the full on-stage keynote address. HOW DO I JOIN THE INSIDER LAUNCH TEAM? 2. Forward your receipt to TEAMDAVIDBACH@GMAIL.COM. 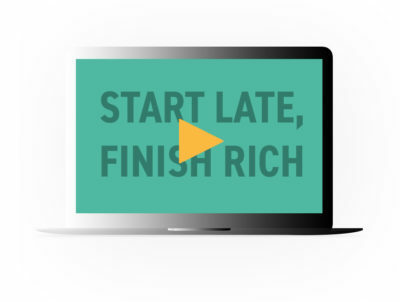 You’ll receive an email with next steps to claim your bonuses. Your investment will be the cost of one copy of The Latte Factor—which is currently approximately $14! In return, I am going to give you all the bonuses above. They are worth more than $500 in value and I will spend over a month with you personally coaching you to live your richest life NOW! And remember, you’re going to get a preview copy of The Latte Factor before it’s released!!!!! AWESOME, RIGHT?! Let’s do this! WHO IS THIS INSIDER LAUNCH TEAM RIGHT FOR? You’re already on the insider list because you raised your hand and said you wanted in. 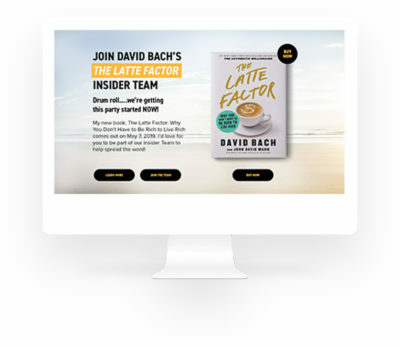 If you have loved my books and work in the past and I have helped you, I truly hope you’ll join me on this journey and be a part of THE LATTE FACTOR INSIDER LAUNCH TEAM. This is my last book and tour before I take a sabbatical to Florence, Italy. I have written this book to touch people around the world. I want to share it with you and then inspire you to share the lessons with your friends, family and the people you love that you believe this book can help. 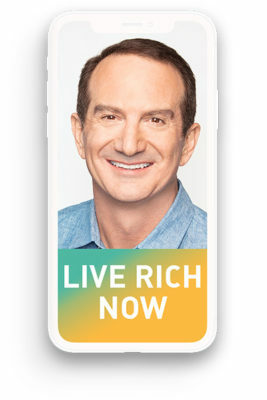 I’m hoping you’re ready to SHARE the lessons forward and help others to live and finish rich. You have my promise that I will make this program worth your time and 40X more valuable than the $14 the book will cost you. Together I believe we can make a dent in the world. So will you…please join me? What if there were a way you could achieve financial freedom and you live your dreams, without taking big risks or making drastic changes? A way that actually worked. 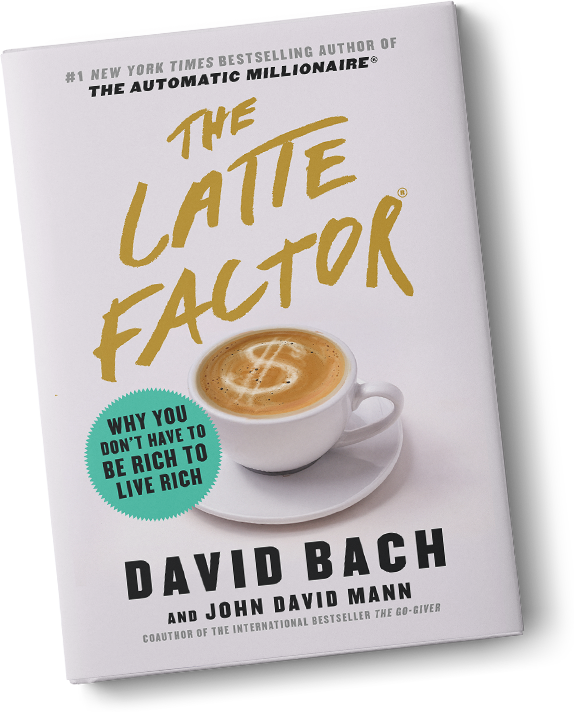 Welcome to The Latte Factor—an inspiring parable that presents three timeliness secrets to financial freedom that will help you discover you are richer than you think. 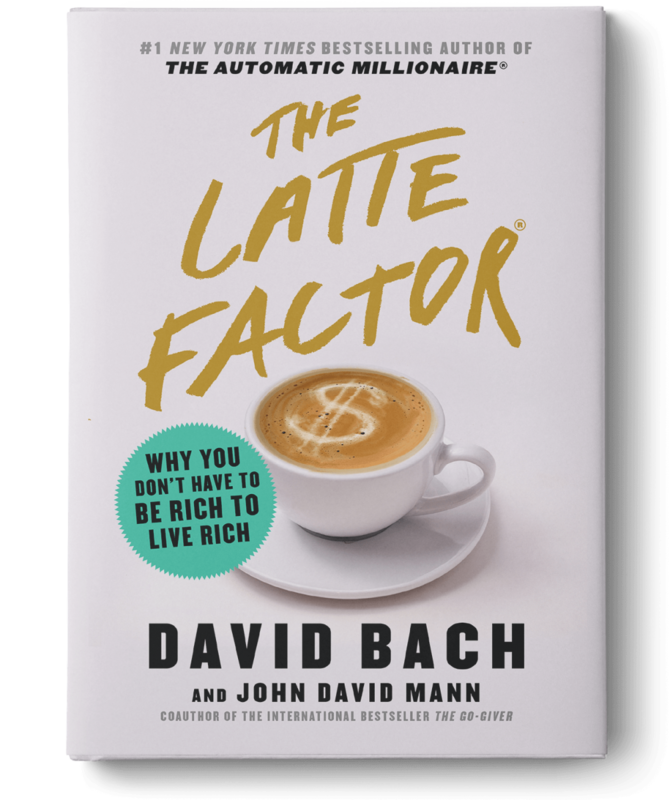 From legendary personal finance expert David Bach (The Automatic Millionaire) and master storyteller John David Mann (The Go-Giver), The Latte Factor tells the story of Zoey Daniels, a twenty-something professional, living and working in New York City. Zoey likes her job and she’s good at it—but no matter how hard she works, she still struggles to make ends meet under a growing burden of student loans and credit card debt. And she can’t help wondering: Is this all there is to life. Zoey cannot see any way off her endless treadmill—until one morning, when she strikes up a conversation with Henry, the elderly barista at her favorite Brooklyn coffee shop. Over the next few days, as Henry reveals what he calls the “Three Secrets to Financial Freedom,” Zoey discovers that there is more to his life story than meets the eye—and that by following the simple, proven path he describes, she truly can create the life she’s always wanted. From Baby Boomers who worry if they’ve saved enough for retirement, to Millennials who are drowning in student loan debt, to young Gen Zers who want to make smarter choices than the generations that have come before, The Latte Factor can help anyone, of any age, achieve financial independence. At once page turning and heartwarming, The Latte Factor is an inspiring story you can read in less than an hour, but its impact can last for a lifetime. Ha. You know me already! Click here if you want the boring bio. I’m the guy who has spent more than two decades teaching people worldwide to “Pay Themselves First”–and to save and invest automatically. Many people – maybe you know me for the Latte Factor® – the simple idea that small amounts of money not wasted can be saved and help you reach financial freedom. That simple idea has gone viral all over the world and inspired millions. It’s also brought out the haters – who think I’m trying to take their coffee away. The Latte Factor is not about the coffee, my friends. 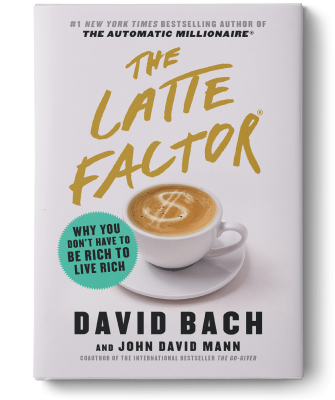 The Latte Factor is about how to live your richest life now. This little story will inspire you to realize you’re richer than you think. You’re stronger than you know. Your dreams are closer than you realize. Trust me it’s not just my mom who thinks this book rocks. My wife likes it too. 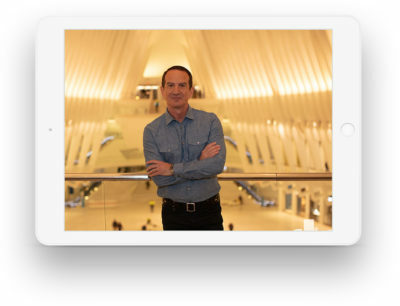 DAN SULLIVAN, The Strategic Coach, Inc.
JOE POLISH, founder of Genius Network® and GeniusX®, president of Piranha Marketing Inc. SO DID YOU JOIN US? You scrolled all the way down here! You’re like me––you like to read everything. Now, go click on a buy button. 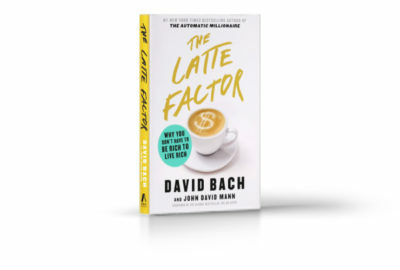 Get your copy of The Latte Factor, send the receipt to TEAMDAVIDBACH@GMAIL.COM, and you will receive an email confirmation with all the details. Now, you’re officially on the INSIDER LAUNCH TEAM! I told you before––sharing is caring. It’s totally true. You can do it with these buttons right here. Thank you! © Copyright 2019 | David Bach & FinishRich Media LLC. All Rights Reserved.